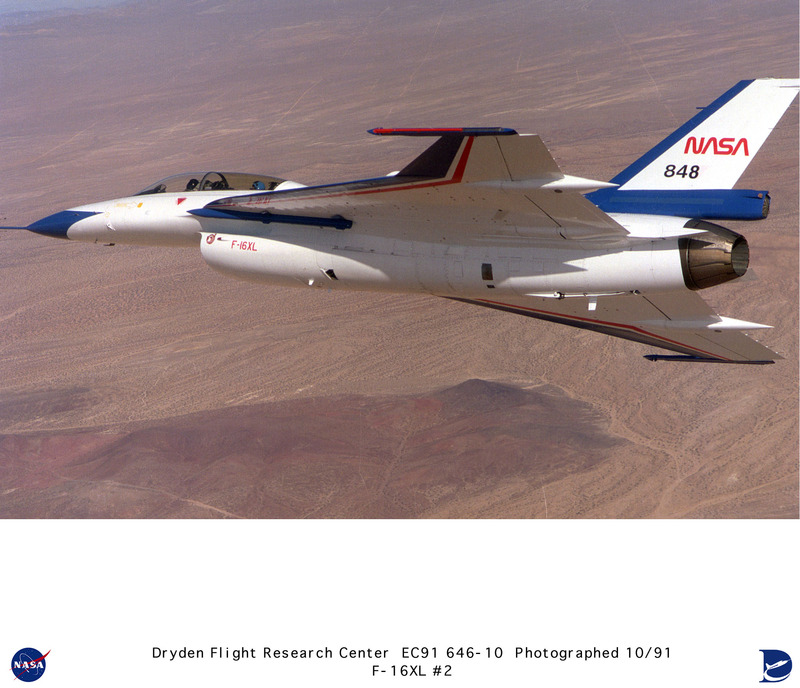 Description: NASA 848 was one of two modified F-16XL aircraft NASA used at the Dryden Flight Research Center, Edwards, California, to investigate laminar flow at supersonic speeds in a program to improve the design of possible future civil transports and high-performance military aircraft. NASA's "XL" research involved testing an experimental glove on the left wing of the aircraft, which was designed to achieve laminar (smooth) flow over a major portion of the wing during flight, reducing drag and, thereby, also reducing fuel consumption or extending the range of an aircraft. Research flights with an experimental wing device on NASA 848, a two-seat aircraft, began in October of 1995 and continued until November of 1996. A sistership, the single-seat F-16XL, flew the first phase of the research program and achieved supersonic laminar flow over a portion of a different experimental wing device.